Recently the owners of QRZ.com Callsign Database started restricting access to addresses and other data unless you were a registered user. If you used a logging program, such as CQRLOG, you would have to pay a yearly fee to access this mostly public information. I'd much rather give a donation to a group that is trying to do the right thing rather than have my information held hostage for ransom. Because of this I'd like to introduce HamQTH. 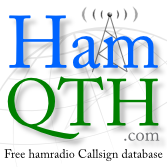 HamQTH is a free ham radio callsign database that provides similar information but is completely free. The owner of the data (you) gets to determine what is visible and what isn't. I encourage everyone to visit HamQTH and try it out. I already use it for my logging program and have received great results so far. And best of all it's all free!